MIT Research Shows Brain Wave Stimulation Might Help Alzheimer’s « Adafruit Industries – Makers, hackers, artists, designers and engineers! 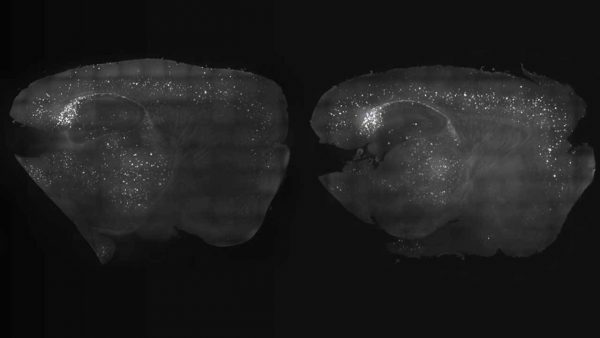 MIT neuroscientists have exposed mice to a unique combination of light and sound and proven that the brain wave stimulation can improve cognitive and memory impairments in mice. The team says that the impairments they have treated in mice are similar to those seen in Alzheimer’s patients. The treatment is non-invasive and works by inducing a type of brain wave called gamma oscillations. Researchers also found that the treatment “greatly reduced” the number of amyloid plaques found in the brains of mice in testing. Those plaques were cleared in large swaths of the brain, including in areas for cognitive function like learning and memory.